What Is a Cheerios Penny and Why Were They Made? An example of a 2000 Cheerios Penny. Image Copyright: © 2017 James Bucki; All rights reserved. 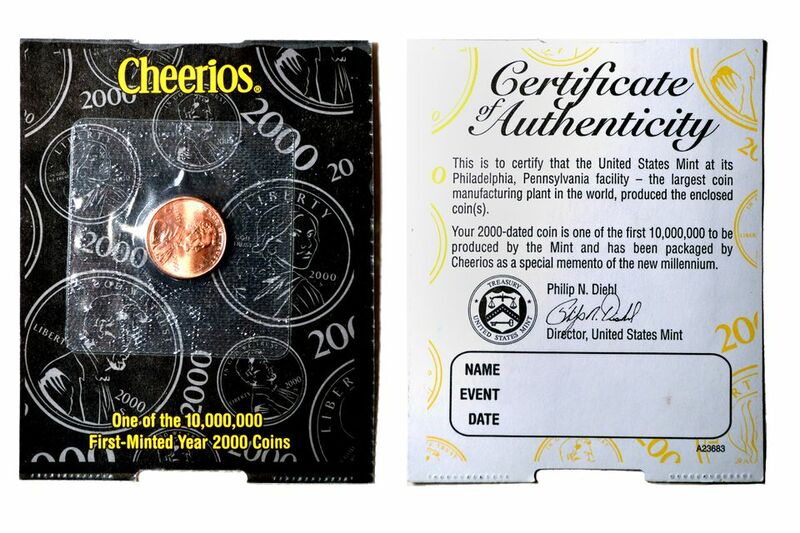 A Cheerios Penny is a year 2000 Lincoln Memorial penny that was put into a Cheerios cereal box for a special promotion in early 2000. The U.S. Mint provided 10,000,000 freshly-struck pennies, plus 5,500 brand new Sacagawea Dollars to General Mills, who placed them onto plastic-sealed cards (see photo) which then went into cereal boxes. Although the vast majority of the cards had one coin on them, (the penny,) 5,500 of the cards had two coins, the penny and a Sacagawea Dollar. The point of the promotion was to help raise awareness about the then-new Sacagawea "Golden Dollars." The reason these coins are noteworthy today is that the so-called Cheerios Dollars were struck from different dies than normal Sacagawea Dollars, making them a very rare variety. The average Cheerios Penny which is still on its card is worth about $5 on eBay. (A 2000 Lincoln Cent that is not on the sealed Cheerios card is only worth face value.) Although Cheerios Pennies are generally nothing special, a small percentage have been found to have come from dies meant for Proof pennies, and they have the "Wide AM" reverse die type. In 1971 The United States Mint produced the first Eisenhower or "Ike" dollar. This was the first dollar coin produced in the United States since the Peace dollar in 1935. The Ike Dollar was a big and hefty coin. It did not circulate widely because of its size. In an effort to encourage people to use dollar coins instead of one dollar paper bills, The United States Mint produced the Susan B. Anthony dollar in 1979. This smaller dollar coin was slightly larger than a quarter, made of the same copper-nickel clad composition and had a reeded edge like the quarter. Unfortunately, many people confused this coin with a quarter and ended up paying a dollar for something that should've only cost them twenty-five cents. This made the Susan B. Anthony dollar coin very unpopular. In 2000 the United States Mint introduced a new dollar coin that was smaller than the Eisenhower dollar but yet dramatically different from the currently circulating Washington quarter. Although the Sacajawea Dollar coin was only slightly larger than a quarter, it was made out of a manganese-brass clad composition that had a golden color to it. Additionally, the coin's edge had no reeding and was smooth. These changes made it significantly different than the quarter so people would not confuse it with the currently circulating twenty-five cent coin. These new coins were randomly placed in boxes of Cheerios cereal in order to draw attention to the new one dollar coin. More information about the "Wide AM" variety coin can be found on the list of top 10 most valuable coins found in pocket change. The Cheerios Penny is one of the more unusual cereal-box prizes in recent memory, and probably would have been forgotten had the Cheerios Dollars not been discovered to be so rare.